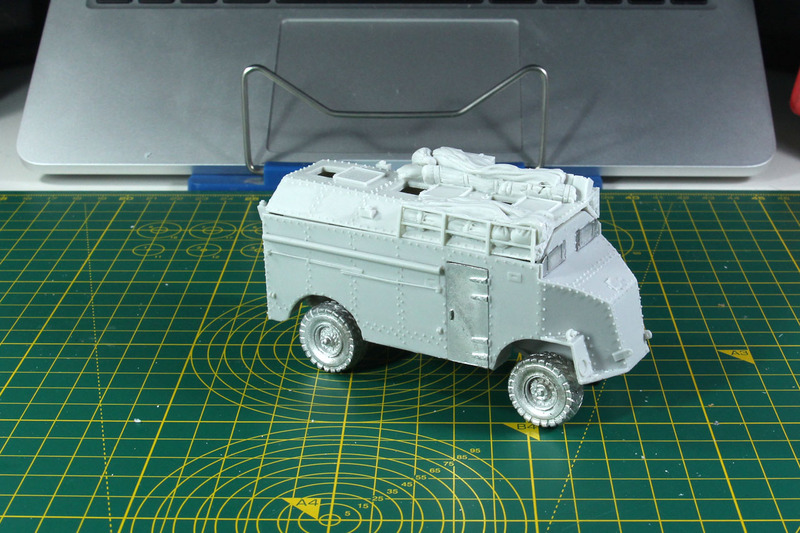 Fresh from the molds, the AEC Command Vehicle by Perry Miniatures, directly covered as a review as part of the Africa themed week. The AEC 4x4 Command Vehicle was the most common ACV (armoured command vehicle) of the British Army. 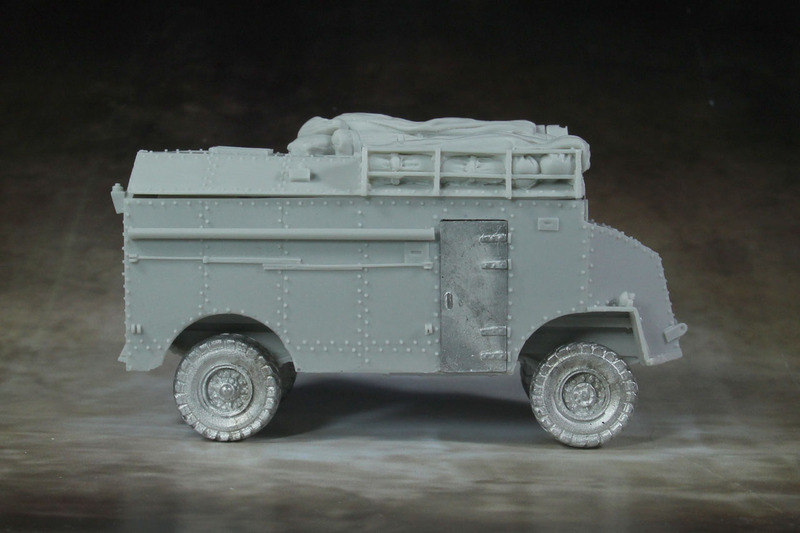 It was based upon the AEC Matador chassis (although available by the Perrys as code WR W47), as the British used to develop and employ purpose-built armoured trucks and busses as command vehicles. 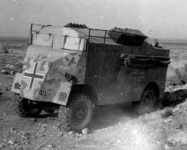 Of the AEC 4x4 ACV were a total of 415 units built and it saw action for the first time in the North African Campaign and was used until the end of the war. It was named after the luxury Dorchester hotel in London by the troops for his size and comfortabiliy. 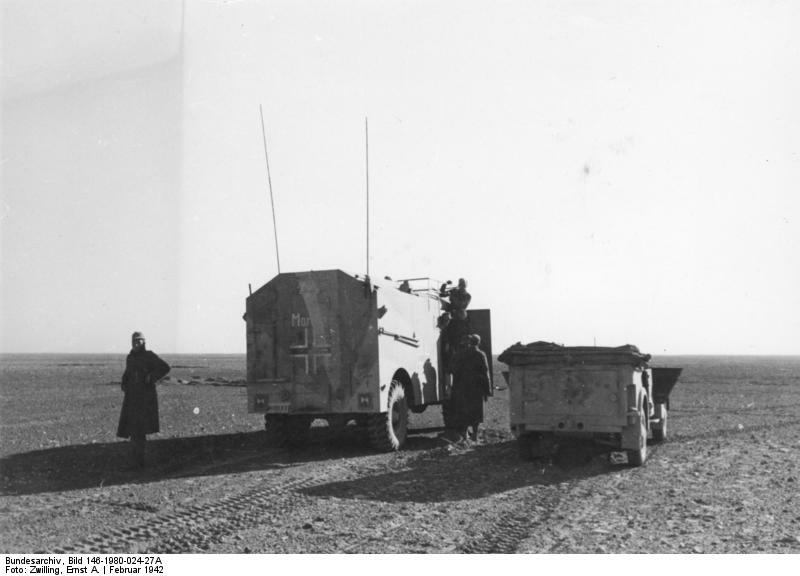 The Deutsche Afrikakorps managed to capture three of these vehicles, and two of them were employed by Rommel and his staff, renamed as Max and Moritz. 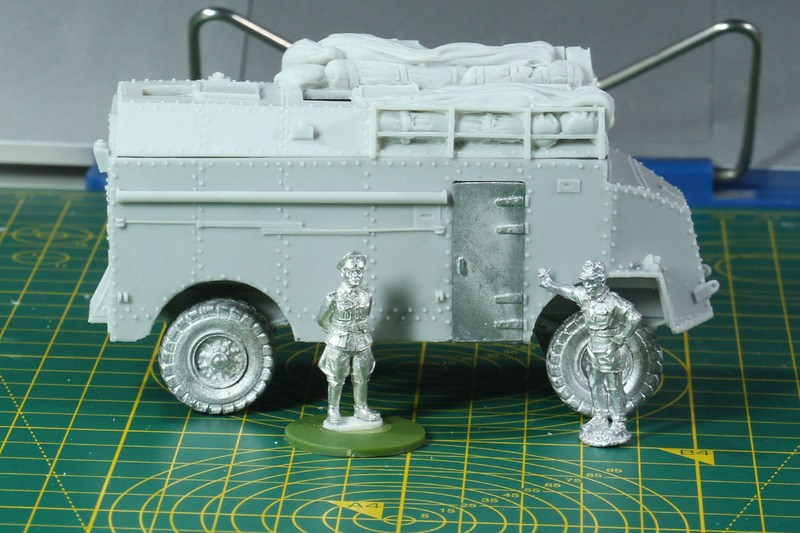 This vehicle was made by John Hart for Perry Miniatures and is available as a resin model with metal parts and additional figures. 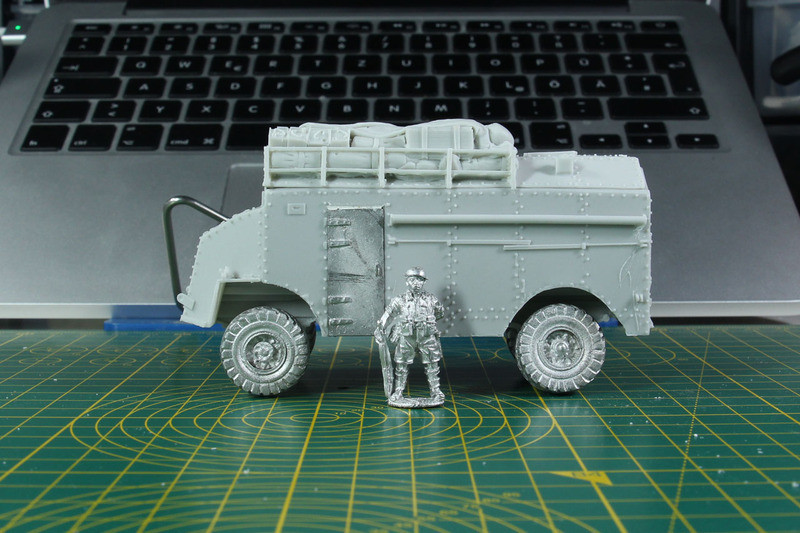 It is kept in 28mm / 1:56 scale and costs 25 GBP. 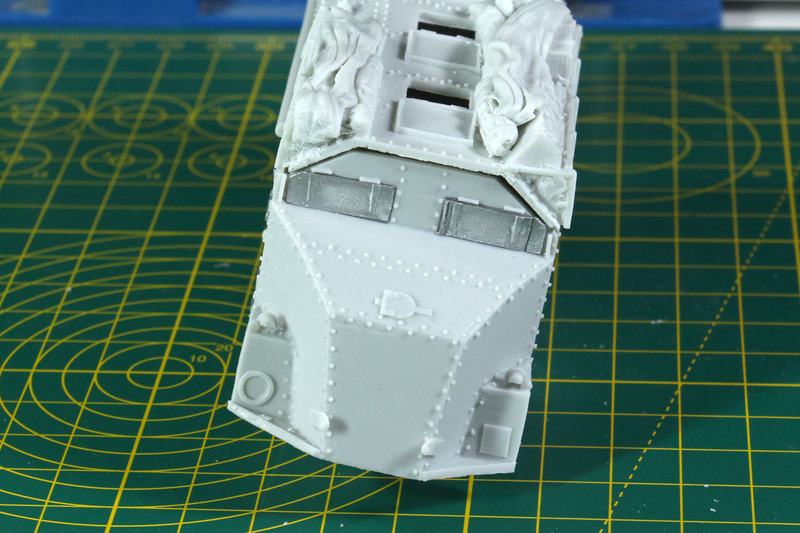 It currently is only available with a british crew, but the Perrys already said, that they were preparing another layout with a german command. 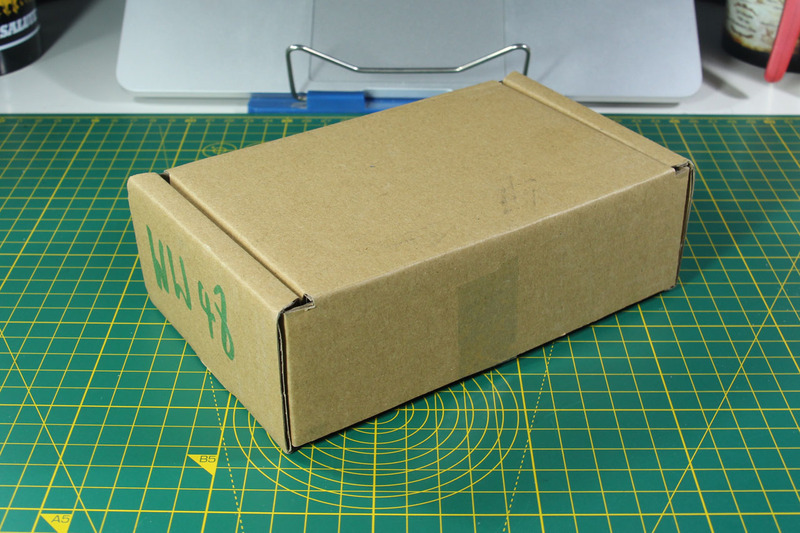 The kit comes in a blank cardboard box with just the product code written on its side. 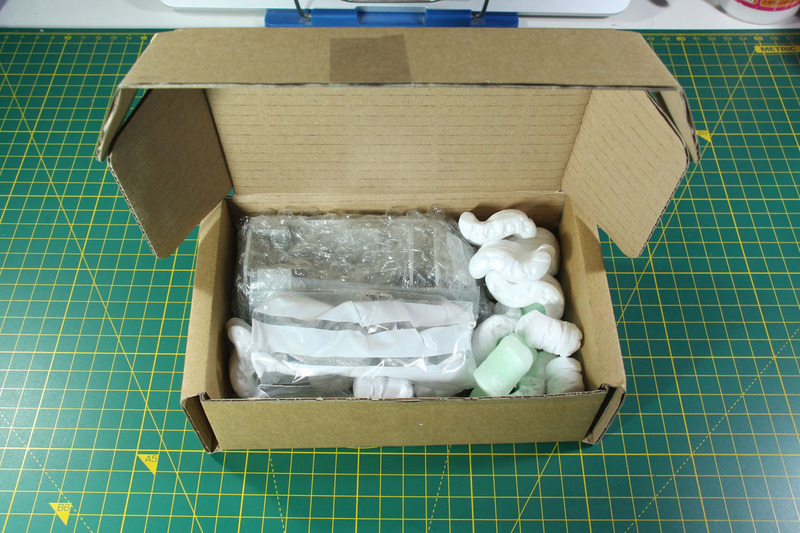 Inside there are three bags, one made from bubble wrap and added foam chips to secure the content. The truck body is wrapped in bubble wrap, the roof is in a zip lock bag. 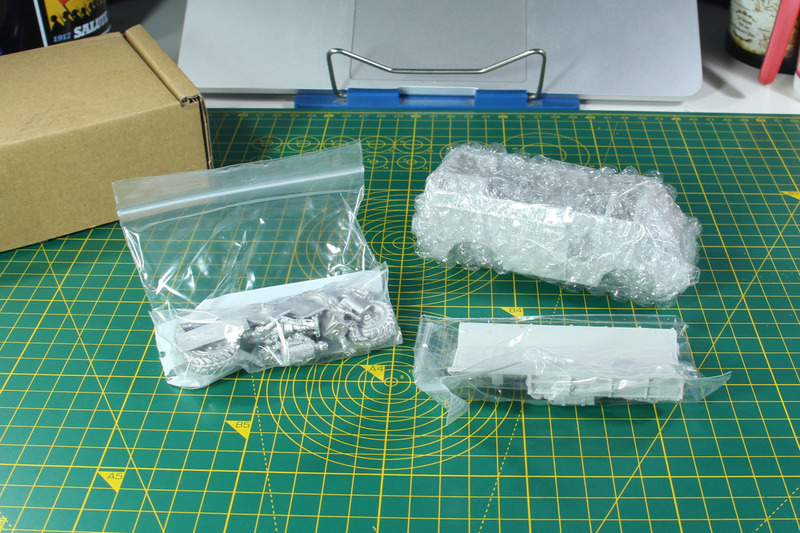 The second zip lock bag covers all of the metal parts. There are the three crew members in chairs, two empty chairs, a warden, four tires, three doors, the table incl. support leg and two armoured blinds for the front windows. The body has thin layers of resin on the doors and windows. Those need to be removed, but can easily be removed with a scalpel or modelling knife. The ones on the front windows are a bit more sturdy. 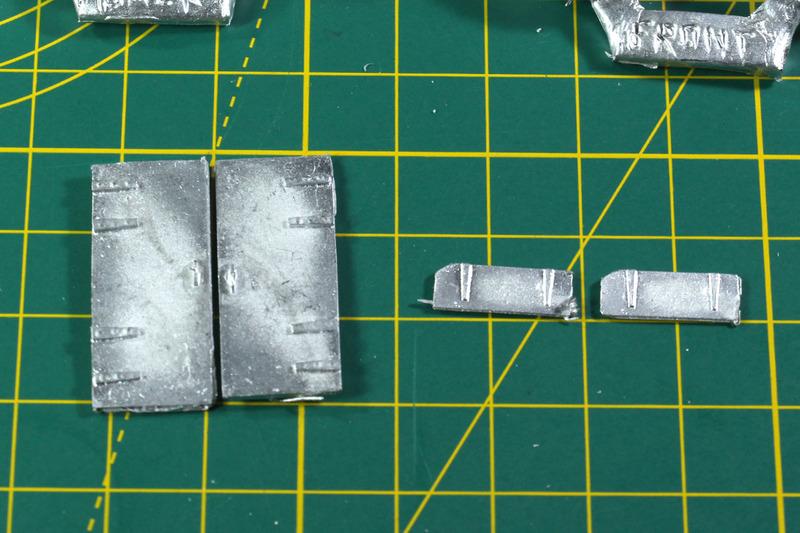 Other than that, there is a bit of clean up to do, as there was a slight offset of the mold and a few mold lines. Some of them ran across the rivets of the roof. 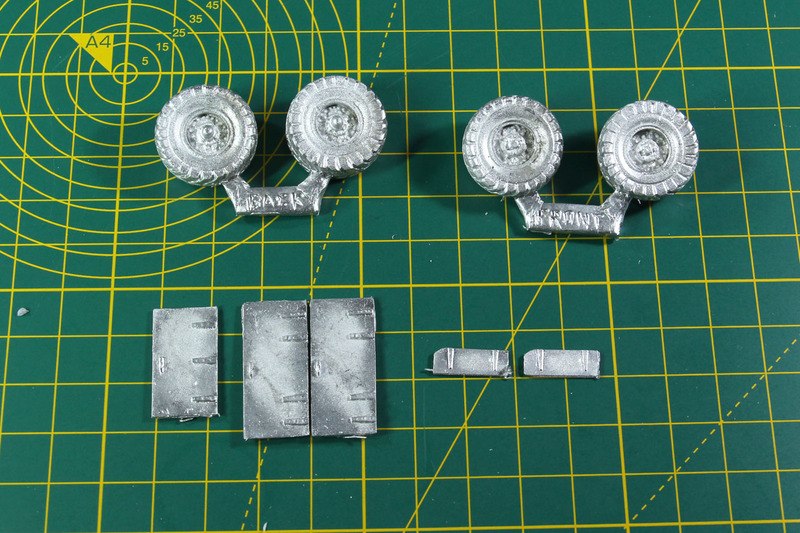 As usual with resin kits, the resin parts were washed with a luke warm soap water. I cleaned the metal parts of the chassis and noted two mistakes. Both of the side doors were right ones, and both of the armoured blinds where left ones. You see the side doors can not simply be turned by 180°, but the position of the angles and the orientation of the door handle is a bit off. But as both are on opposed parts of the vehicle, it won't be that noticable. Never the less, poor mistake. I added the doors and modified the door handle on the left side, so that it would look closer. There was a gap above the left side door and I filled that with Milliput. As with the window blinds, I cut the second one up and rearrange the parts to make it fit. Normally I would have dropped them an e-Mail and waited for a replacement, but I wanted to keep the pace going and finally build this kit. Next up are the wheels. There are two pairs, different ones for the front and back. Keep an eye on the rotation when you add them. 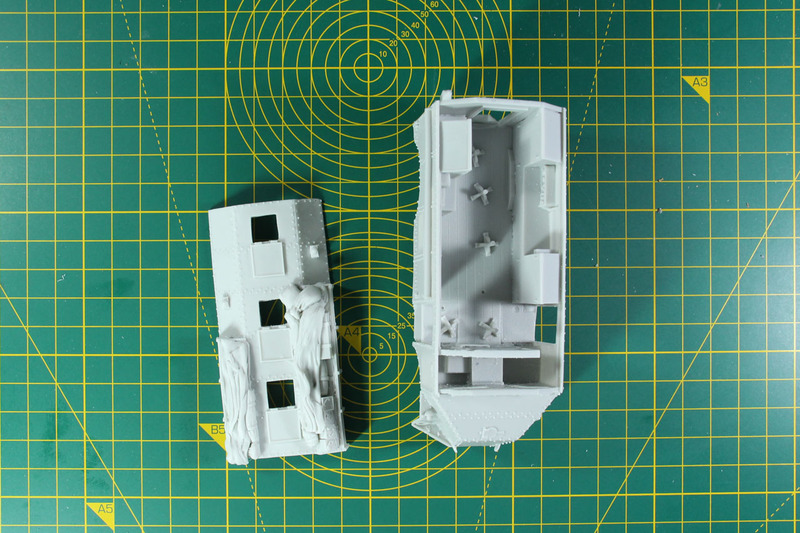 The cast is rather sturdy and has a big connection to the sprue handle. A fifth spare wheel would have been great to add to the roof or something as stowage. The casting one some parts isn't the best. 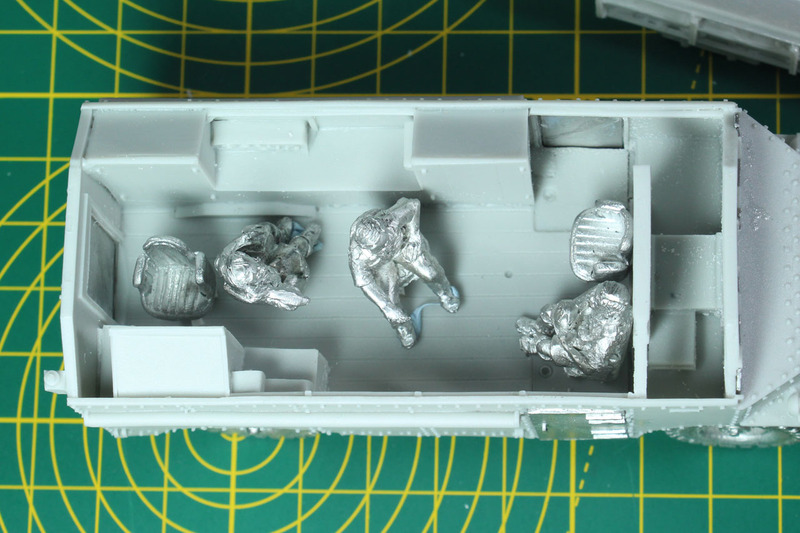 The stowage on the roof is damaged and there will be the need to fix this with some green stuff. The gap in the front and back of the roof has to be fixed as well. 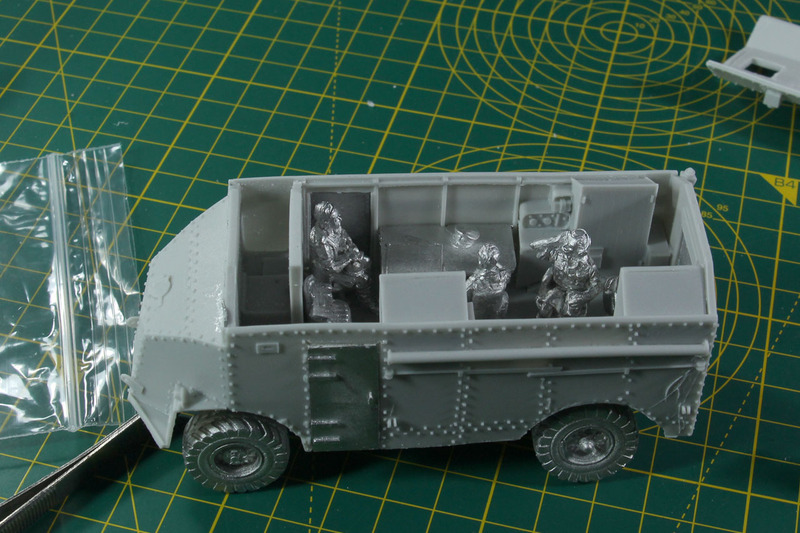 Maybe add some camouflage netting, depending on what I am going to do with the interior. As we're speaking of the interior. 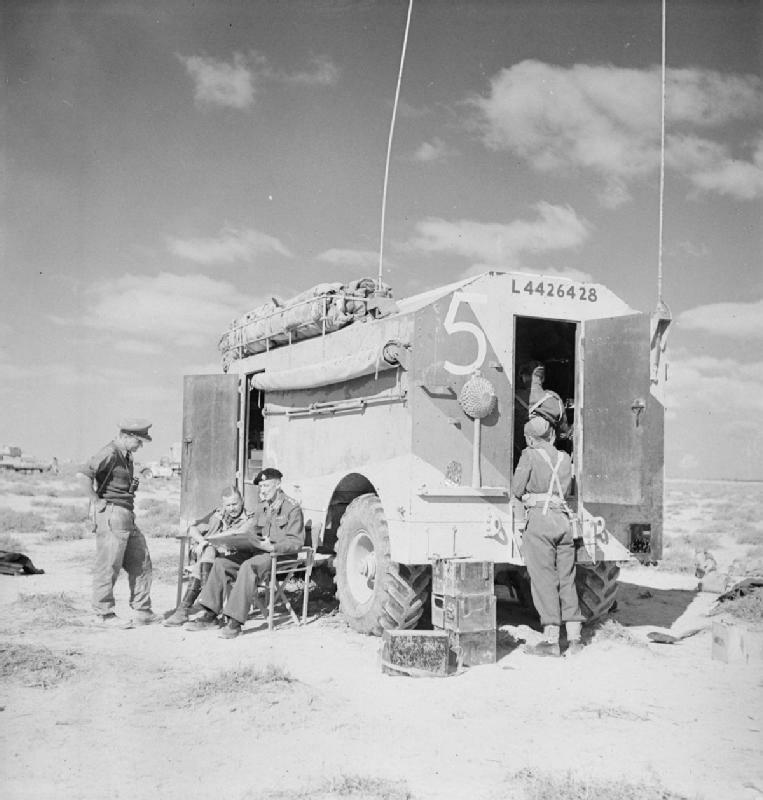 There are five seats inside the AEC, three seats are taken by the radio operator, the commander and a soldier, the two others are empty. And there is a table with a map and officers hat for the command as well. The kit comes with a individual warden miniature. 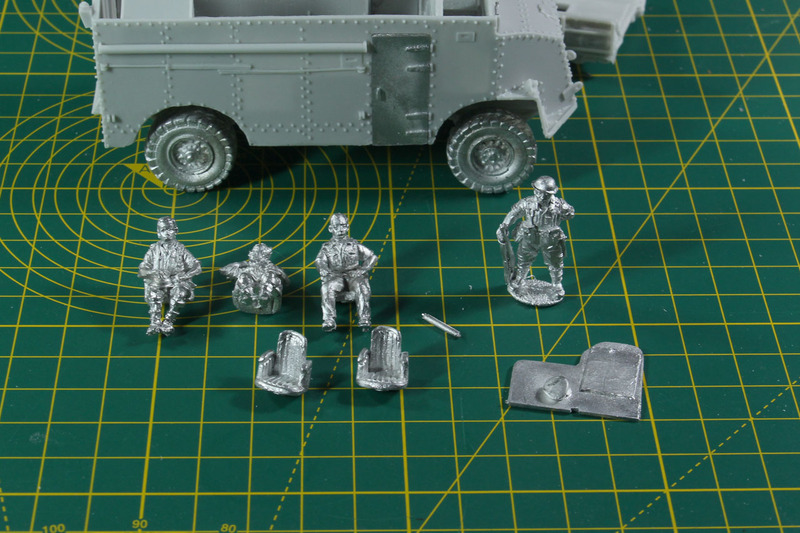 The crew isn't glued into place, just fixed with blu-tac. 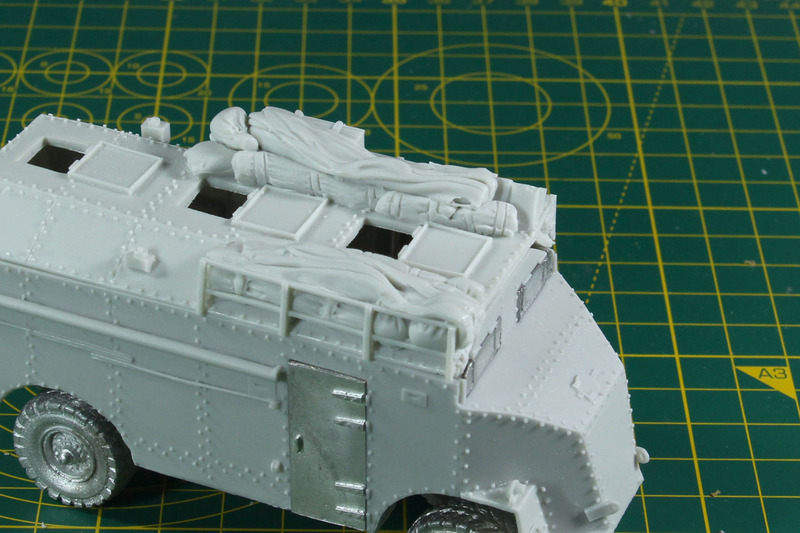 It is best to paint them before glueing into position, as the interior and extras are nicely detailled and it would be a shame to not use that. The additional soldier at guard just for size comparison. 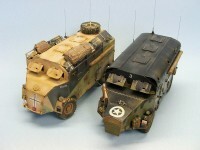 As mentioned before, there were two AEC used by Rommel, so you can use them with your Afrikakorps if you want to. 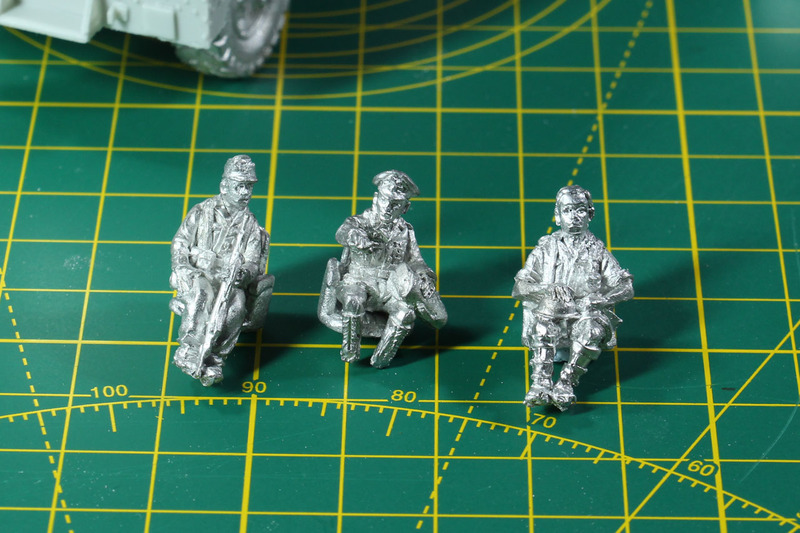 As long as the official kit isn't available you can use the Perry Miniatures vehicle crew, as most of them fit into the empty chairs without or with only a bit of of converting. 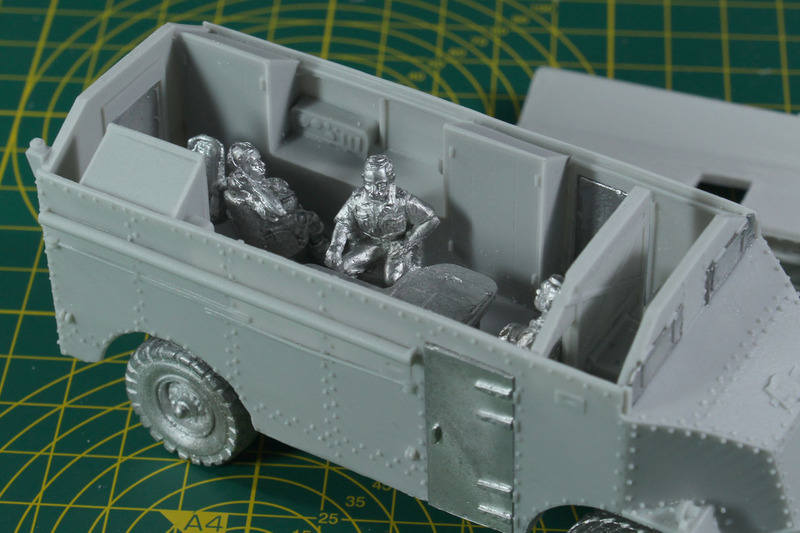 Perry Miniatures has a couple of matching crews, like the GWW 34 Luftwaffe air crew and ground crew or GWW 20 Seated half section and driver. 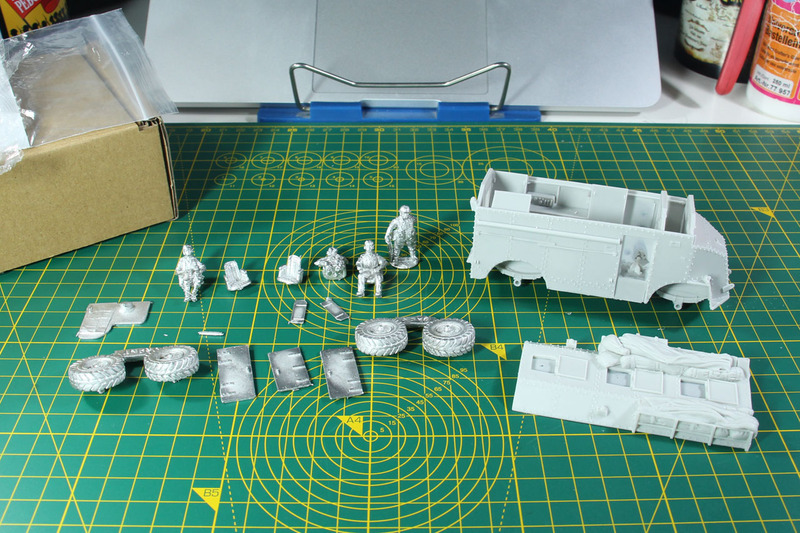 A brief size comparison with the SdKfz 250/3 Greif command car and a Opel Blitz. 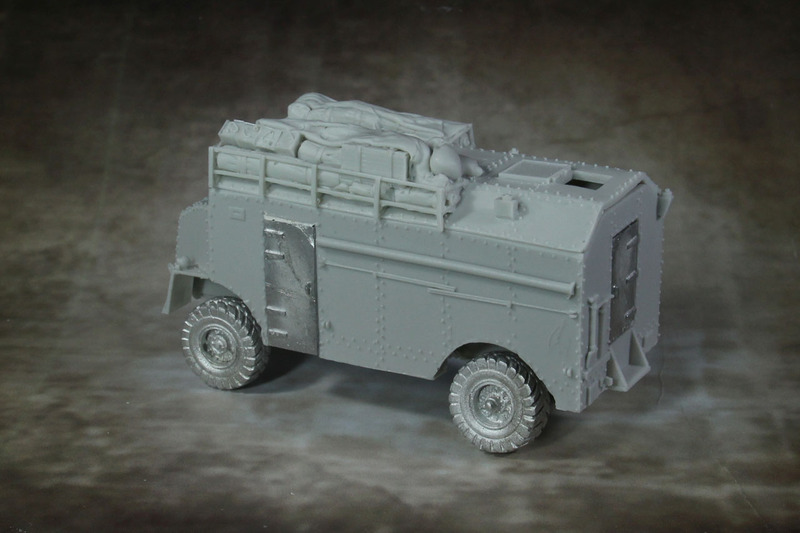 As there are no product pictures for painting reference at the Perry Miniatures website, I added a few images of the AEC in british and german service. Sources of the pictures is Wikicommons. 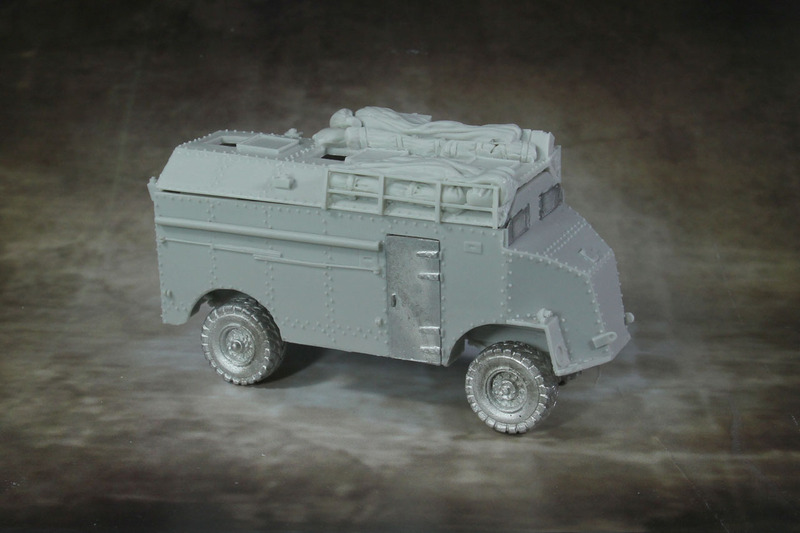 And for a real superb creative input, I suggest the blog of the brazilian model kit builder PanzerSerra. He did a great double build on this vehicle, based upon a 1:35 scale model kit by Panzer Resin Models, and build the AEC Dorchester Mammut "Moritz" - Afrika Korps and AEC Dorchester ACV - Polish Command car variant. 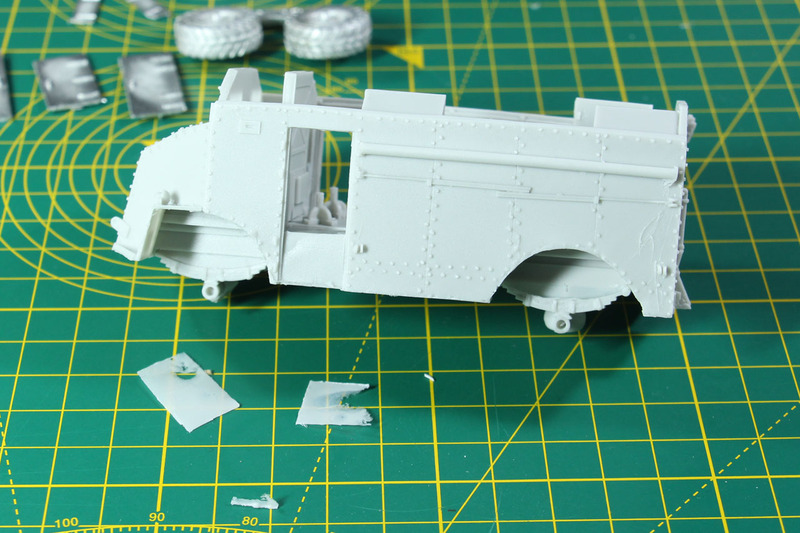 There are some differences to this kit, but he goes into detail on the modification that he made and where he researched them. 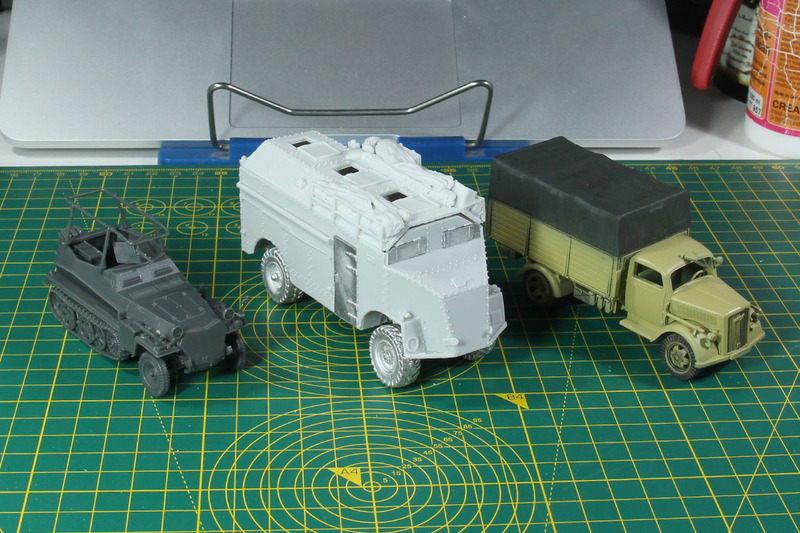 And the final assembled AEC Dorchester 4x4 ACV from a few different angles. 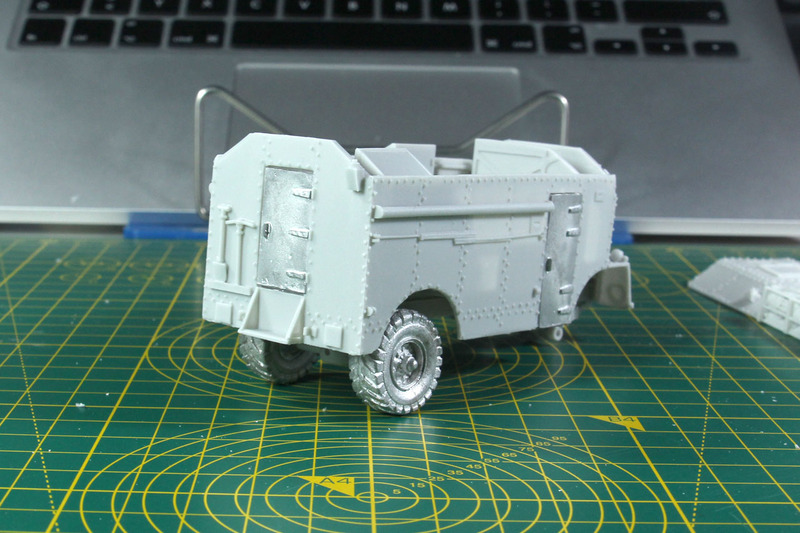 John Hart did a great job bringing this vehicle into 28mm scale. The only other alternative is offered by Company B and from the former experiences I had with their kits, this one - even with the mispacks and misaligned parts - is far superior. Perry Miniatures charges 25 GBP for this kit, the Company B one is 34 USD (which translated into roughly the same price). The extra mile they went with the interior is amazing. Never the less, the roof is a weak point of the kit. You are forced to have it opened and the stowage is fixed. If they went with a blank roof, with individual lids that could be build open or closed and and empty stowage rack with individual parts, that could be added as taste, it would have been far better (and likely easier to cast). 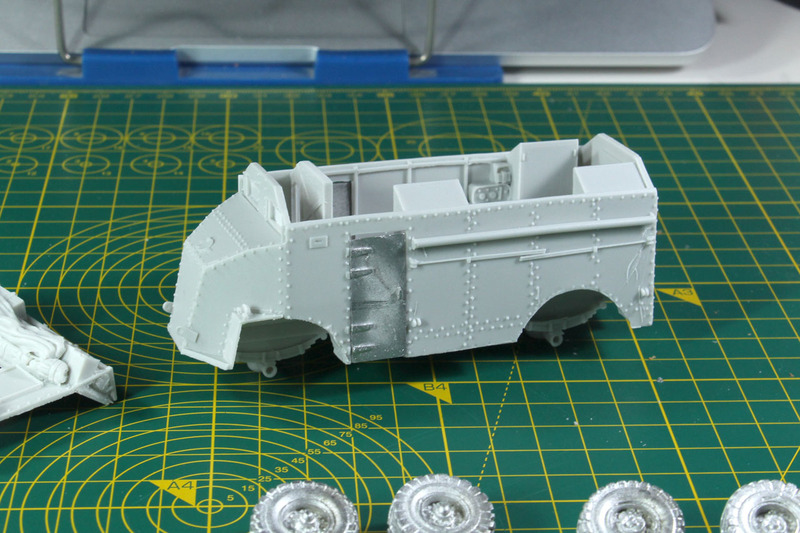 The wheels have rather thin connection points, to it might make sense to pin them or to base the whole vehicle. 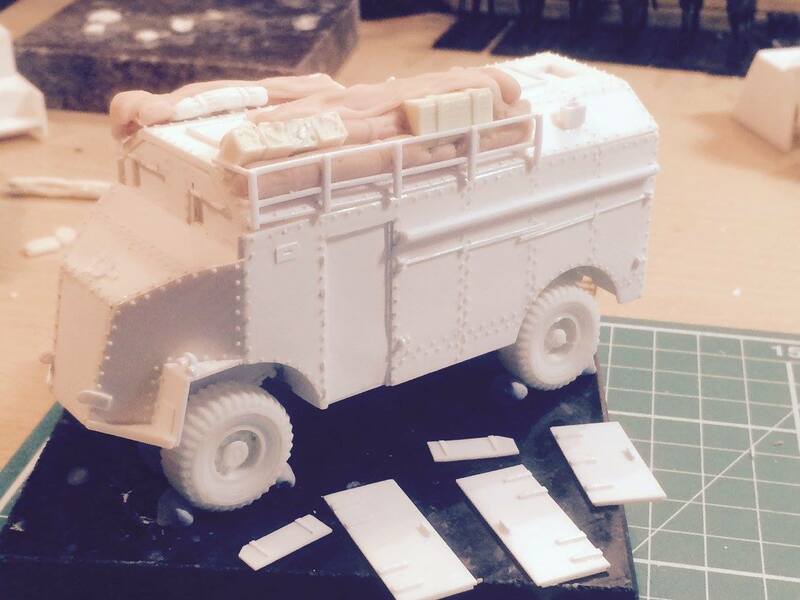 It will be interesting to see the german crew package for this one, and I hope that it will be available individually. Other than that, It would have been great, if the chairs were empty and the three crew members were added into the chairs. But that is critic on a very high level and just a wish, not a problem. As this was one of the first casts (I pre-ordered the kit for Crisis and got it on the release weekend), I'm a bit confused by the mispack, as the concentration should be better with the first ones compared to later packs and I hope that this was a one-time thing. Never the less, if you should have the same problem, just send them an e-Mail customer service of Perry Miniatures and Dave Thomas is usually ace. Other than that, as far as I am able to fix the fit of the roof, I am more than pleased with this kit, as I fell in love with the concept of the AEC and the fact, that there is the duo of Max and Moritz. Such a characterful option for your army, not a UBER-strong piece for your army, but a themeful addition to your collection. 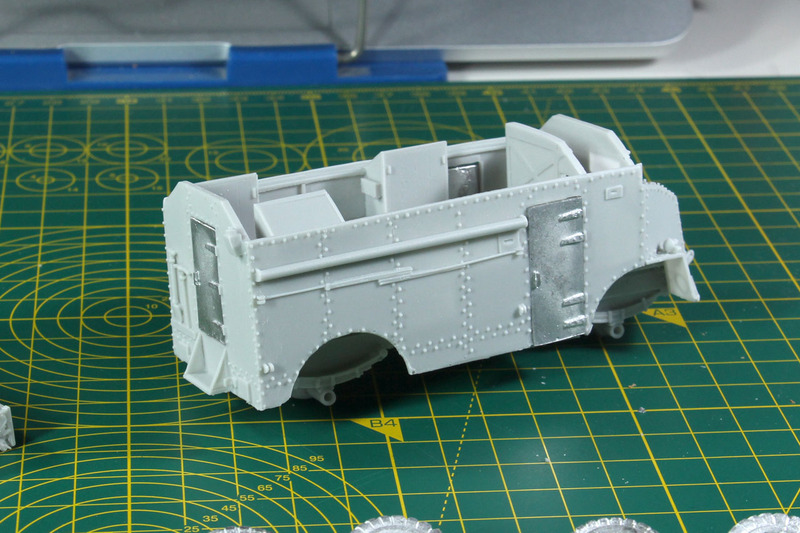 This one will be built and paint as Moritz later on.